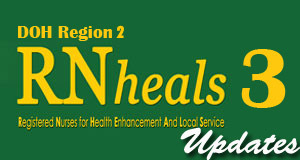 RN Heals 3 DOH-CHD Region 2 -Cagayan Valley is still accepting an applicant according to April Cauzon,who recently submit her RN Heals 3 applications in Center for Health Development in Region 2 (CHD-2 ,Cagayan Valley) in Tuguegarao City. For those who miss submitting their application this is your chance grab it Now! !